You guys know that I love love love trying out new products for you all and I only share the BEST ones that make the cut! 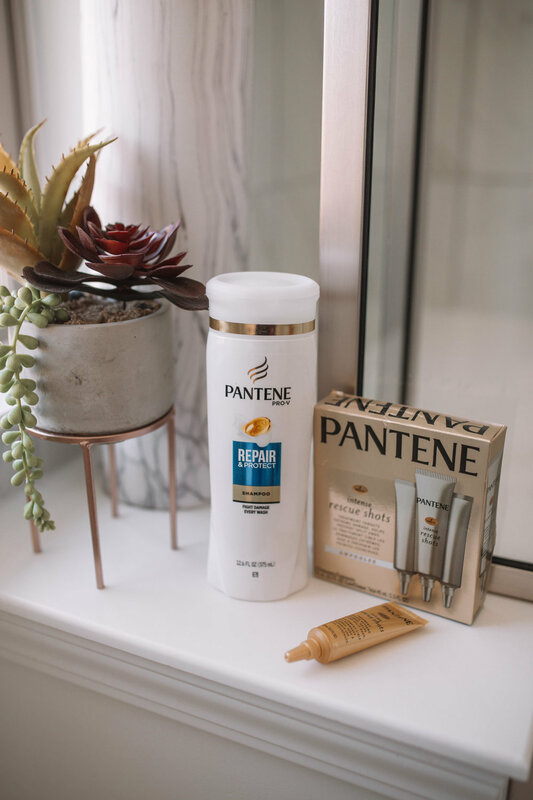 Well, I'm happy to share that about 3 weeks ago I tried out the new Pantene Pro-V Intense Rescue Shots for the first time and I was amazed by the noticeable difference I saw in my hair after just one use. It’s no wonder they’re the #1 selling new treatment item in the haircare category. My hair felt incredible! My typically dry and brittle ends were silky and smooth all the way from root to tip! I loved them so much that I packed them for my trip to LA and Arizona and I've been amazed by the results I've seen! The Pantene Pro-V Intense Rescue Shots are imported from Brazil (I'm happy to steal a few tips from Brazilian hair care!!) and they just hit the shelves at the beginning of the year. It's Pantene's most potent repair product yet and unlike other masks, it'll provide deep conditioning without weighing down your hair. The Pantene Pro-V Intense Rescue Shots are super easy to use and actually can be used in place of your normal conditioner once a week. Just shampoo your hair (I've been using the Pantene Repair & Protect Shampoo) and then apply the Pantene Pro-V Intense Rescue Shots generously to fully saturate your hair, root to tip. I like to focus a little more on my ends where my hair sees the most damage. After waiting 30 seconds, rinse your hair for about 30 seconds (don't over rinse!) and you'll be amazed at how silky your hair feels! My hair is typically very dry and damaged from all of the heat that I use on it every single day and the summer months really take a toll on my hair with the extra exposure to sun, heat, and chlorine. The ends of my hair get very dry and brittle and eventually break. I've made it a goal to take better care of my hair and add back as much moisture as possible. I was so excited to test out the new Pantene Pro-V Intense Rescue Shots and they certainly exceeded my expectations. I can't wait for you to give them a try! You can find them on Amazon.